Don't have an account yet? Click here to create your very own Neopets.com account and get started in your shopping experience! Click a link below for individual item details. Shoyru Day! Shoyru Day is celebrated in Neopia this year one day early (what a surprise) and along with it a whopping fourteen new Shoyru wearables! There's also a chilling Ice, and romantic Zombie colour available for any Shoyru. Made with real Shoyru meat. HIATUS As you may have noticed, new items haven't been added over the past few weeks. I'm going to be taking a break from updates for a while, partly because I am a lazy toad, and partly because it's boring and laborious to add them. Modified top boxes to be more relevant andinformative. Shortened Fashion section. There will now only be one fashionable theme at a time. Removed Passe section to shorten the page. It was also a pain to update. Updated image submission area so it's easier to understand. Tool tips displayed over areas or words which need explaining. Remodelled catalogue. You can now search for multi-species items by type. Smaller, more compact item boxes. Three to a line. Item previews only viewed if you hover over them. Hopefully shorter page loading time. I've worked hard to try and compact everything down to be as minimal as possible. This is only the beginning. The page will probably be changing over the course of 2 or 3 weeks to further tweak things. There's even a whole new feature I've yet to add. It's been a long time coming, and rushed ironically, but I hope you like it more than the last anyway! Sloth has returned, as so too have the ultra-chic space fashions from years ago. Dr Sloth Beanie perhaps? Kreludan Grundo Slippers? Piece together an amazing outfit to complement your view. We have a chat with the Space Faerie, to see what she has to say about Dr Sloth's return, as well as more important issues. Welcome to N Magazine, fashion capital of Neopia, and wearable clothing guide to thousands of restockers, trend setters, and Neopians like yourself! N Magazine hosts a whole range of features including a full wearable item catalogue, fashionable and unfashionable articles and clothing ideas, a list of Neopia's latest wearables and much more to aid you in your clothing conquest. N Magazine also provides entertainment such as Ntunes, Neopias own online radio, and a collection of awards and trophies to prove your fashion status. So what are you waiting for? Click on one of the links at the top of the page to get started. Looking for something extra ordinary? Step into Year Ten with some of these emerging new fashions from around Neopia, and be sure to stand out from the croud. Just when we all thought Dr Sloth had bid farewell to Neopia for good, rumours are spreading that he's making a big comeback. Whether this is simple speculation, or based on real evidence, it sems Neopia is a buzz with all sorts of space themed goods, from Kreludan Grundo Slippers to Sloth Beanies. So why not join in on the whole fiasco and pick up something to show your allegiance, or bitter hatred, toward one of Neopia's most famous villains. The Space Faerie knows Sloth more than anyone else, but what does she think of the fate of Neopia, and more importantly, what fashion advice can she give to the every day Neopian? N Magazine: A rumour is spreading that the same Dr Sloth you banished years ago, is going to make a comeback in the near future. What do you know of this? Space Faerie: Rumour? I can safely tell you now that Dr Sloth is returning, and he's plotting Neopia's destruction as we speak! N: How on Neopia could you have obtained this knowledge? N: That's astonishing! So it is true! Are you going to protect Neopia again this year? You don't seem to make many public appearances, apart from the Charter boards, and some are even wondering if you've been kidnapped. SF: As you can see, I'm alive and well. As for Neopia, I'll certainly try my best. N: You must've seen some of the new itms people are wearing, even after Sloth Day. Some are dressing up as Sloth, some as Grundo's, some as Space Heroes, including youself. SF: Dr Sloth? Why would anyone want to look like him! He's no reason to celebrate either. The other outfits seem in good spirit though. Anthing to keep up the public awareness has got to be good... Are they really dressing up as me? N: Indeed they are. Blue hair is all the rage at the moment, and not just in Maraqua. Will you be making an appearance in this years fashion show? SF: I have been invited. But with no legs, it's quite tricky to strut the catwalk. I guess I'll just have to float. But that's not nearly as dramatic. N: Are you influenced at all by Neopian fashion? SF: Well I do like to look my best. My usual favourites are blue and red, but I may have to pick up something new for this special occasion. Whatever it is, I can guarantee it won't have Sloth's head embroidered across the front. Copy this code, and paste it wherever you like to link back! View neopia's most easy to use wearable clothing list, stocked full of all the backgrounds, clothing, and equipment you could wish for. A great place for any Neopian to get started. Welcome to the new search feature of the catalogue. From here you can find any type of multi-species clothing without hunting through the entire list. Just pick the clothing type from the list above, then the sub-category that interests you. Click the item you wish for and you'll be taken to the item bio in our catalogue. Happy hunting! Here you'll find wearables to fit your Neopets lower section. Ever wanted to fit into that pair of skinny jeans? Too bad. They aren't wearable. Browse through items your Neopet can wear on the mid section of the body, including shirts, jackets and jerseys. Choose an item that best fits your Neopet's personality. Necklace? Collar? Cape? The choice is up to you and your neck. In this category you'll find hats and masks to suit any occasion, from the formal, to the funny. Too cheap to afford both shirt and pants? Why not get them both in one with the growing selection of full-body suits. Keep your Neopets feet clean and stylish with a pair of high heels or a pair of construction boots perhaps. Find that special something to finish of the perfect outfit you had tucked away for a special occasion. Items in this section can be worn by all species, and all colours except Baby, Maraquan, Fruit/Vege Chias and Mutant. Note: Some species may feature these items as hand-held. Available prize from the Return of Dr Sloth Prize Shop - 5,000 points. Only the most valiant fighters deserve to wear this! Available prize from the Return of Dr Sloth Prize Shop - 10,000 points. Given as a Daily Dare prize on Day 30, 2008. Now you can find out what it feels like to be an ice cream cone! Mmm... this hat may be fun, but it is also quite tasty! Given as a Daily Dare prize on Day 24, 2008. Given as a Daily Dare prize on Day 11, 2008. These goggles will keep all of that dirt out of your eyes. Given as a Daily Dare prize on Day 10, 2008. These mittens are sure to be the envy of all your friends. Given as a Daily Dare prize on Day 8, 2008. This brightly coloured bracelet will add some fun to an outfit. Given as a Daily Dare prize on Day 7, 2008. Ouch... that looks like it hurt! Given as a Daily Dare prize on Day 6, 2008. These shoes are extra tough so they wont melt in the heat of a volcano. Given as a Daily Dare prize on Day 2, 2008. Watch out for falling food! How festive this red derby will look! When it is time to dress up your pet, dont spare any expense. All Neopets will be thrilled to have this tattoo I command it! This mind... uh hat is quite stylish. These pyjamas sure are warm. They are quite heavy, but quite festive. Flying into the holiday will be much easier with these wings. Pants are always great when you need pants. ROAR!!!! Scared ya did we. Its not real fire. That would be dangerous. This protects your hair from those awful cafeteria food fights. Keeps you warm when the air conditioning goes haywire. It only comes in one colour, so you had better like it. The socks are permanently attached. Sorry. This cozy quilt cape is perfect for beating those villians! This cap is a must for the winter season. All weather rubber boots that are high enough to keep you dry in the wettest conditions. This happy looking scarf will give any Neopets a bit of flair. Now your Neopet can dress up as a Gobbler for the harvest festival! If you squeeze the this mask it makes a squawking noise. Mmm... what a tasty looking costume. Shade your head and hide your eyes with this demure autumn themed hat. This pretty little mask will help hide a Neopets identity all while making them look beautiful! Cute and edible these lips will keep you smiling. This mask is perfect for playing some tricks on Halloween. You pet can pretend to be a Hissi with this great float ring. MUAHAHAHA! You shall never defeat me! Disclaimer: One should not stick a candle in their mouth, even while wearing this hat. You will eventually need a matching Plushie Eyrie outfit or its not much of a disguise. The faux fur on this hat really keeps your head warm! Stripes are totally in this season. Keep your clothes shiny when painting with this smock! How cute, now your Neopet can see everything through little pink hearts. Dont worry this doesnt explode. Emulate your favourite fire faerie with these fancy wings! Emulate your favourite earth faerie with these fancy wings! Emulate your favourite dark faerie with these fancy wings! These are pretty heavy, but so worth it. Have some slushie wherever you go. SUPER CONVENIENT!! If anyone says you look like a banana, just point out that bananas do not have red stripes. Owned! These glasses will keep your identity a secret... well maybe. Just dont wrap it too tight. That would be bad. Autumn colours are all the rage nowadays. No Usukicon Y9 attendee should be caught without this badge. Everyone at the con will be wearing these, but its a nice souvenir to take home. This soft feather boa is a great accessory to go with any outfit. Now Aishas arent the only ones that can have six ears! This dashing hat can make even an unremarkable pet look rather adventurous. Wearable. Looking through these spectacles you might see but not percieve if you arent looking correctly. All the cool Neopets are wearing potato sacks these days. Its all the rage in Meridell. A perfect disguise, unless you happen to look like that already. Orange always goes on the left foot! If you see a Neopet wearing this hat, you may be tempted to yell, "A BLECHY IS EATING YOUR HEAD!" Dont. 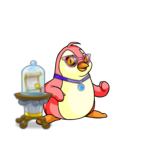 If your Neopet needs a bit of help seeing things, or just wants to look cool, this monocle is great. Every explorer needs a good backpack to carry their food and supplies in. This fun hat looks like like Ednas, and it even comes with ears! This brown velvet hat will make a Neopet look smashing. This blue newsboy hat will look nice with a lot of outfits! Celebrate spring and summer with this charming hat. Neopets will look very dashing in this derby. Items in this section can be worn by all species, and all colours except Baby, Maraquan, Fruit/Vege Chias and Mutant. Note: Some species may feature these items as trinkets. EEEK! Oh wait, that isnt Jhudora flying overhead. This balloon just seems to lurk in the shadows. Giant bubbles? Pop, pop, POP! This purse is perfect for that holiday outfit! This basket is filled full of beautiful berries. This basket is filled full of some of the more pungent berries. All you need to do is roast the hot dog. Mmm... these marshmallows only need to be roasted. 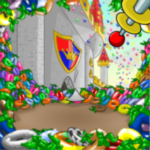 This pail of candy is quite a treat for any Neopet. This puppet is so adorable every Neopet will want one. This adorable puppet is made with super soft fabric. You can move the head, trunk and arms of this adorable puppet. This puppet is a must for Ruki fans. This stylish purse will dress up any outfit. There are a lot of flowers on this purse. Darkness just seems to follow this purse. This darling hand knitted purse is simply charming. Keep that sun off your Neopet with this charming Parasol. Items in this section can be worn by all species, all colours, as well as unconverted pets. Available prize from the Return of Dr Sloth Prize Shop - 3,000 points. Given as a Daily Dare prize on Day 23, 2008. This plant has gotten a bit smashed up! This gnome just keeps wobbling around like it is laughing really hard. Given as a Daily Dare prize on Day 14, 2008. This tree stump is uncomfortable to sit on and just cant be damaged. Whoops! What did these go to? Given as a Daily Dare prize on Day 9, 2008. Which block should you stack first? Dont worry the lava with that comes out of this toy isnt hot. Given as a Daily Dare prize on Day 5, 2008. Kiko candies are quite tasty. This tasty looking gnome can be hard to spot in a garden. Make sure you place this gnome in a shady spot. Uh oh... this gnome seems to like eating flowers! This cute little gnome loves to hum as it flies around the garden. This beautiful tree has leaves that look like hearts! This sparkling shard is a wonderful gift for someone who likes shiny objects. These are perfect for building and making noise! Keep your keepsakes safe with this wonderful trunk. Possible prize when opening a Year 10 Goodie Bag. Confetti is a great way to have a bit of fun at a celebration! Reenact your favourite ballet with this nifty toy. Just the smell for Skunk-painted Neopets. Now you can have fresh borovan at home! Neopets will look and feel ready to ride the river with this icy board. This charming vase of flowers is the perfect gift for someone you care about. Fixing things was never so easy as it is with this toolbox. Feel like a director with a purpose with this slate. This pretty garland is sure to add some winter charm to any Neohome. Get ready to play Carnival of Terror with this fun punching bag. Aww... this ball is perfect for playing catch or kicking around. Yikes... it doesnt have a face! This is one origami that you dont have to worry about breaking. This little Spyder looks like it could walk right up the wall. This is on Uniocto that probably shouldnt go in the water. This tree is great for hiding behind or decorating your Neohome. This stunning Quiguki doll is perfect for the collector that wants the best and rarest dolls. Perfect for practicing your aim. Not the most reliable launcher, but quite fun. Possible booby prize while playing Pick Your Own. This sculpture really shows emotion, colour, and energy in its simplicity... maybe. This pencil case will keep your pencils very safe. Adjust the amount of light shone by this torch with the mouth of the Techo! Who said Techos dont fly? This fun little toy just walks around all day. Its the attack of the little green Techos! Make a wish on this little Pandaphant doll and then when your wish comes true fill in the other eye! How long does it take for someone to knock over blocks that are stacked? Now your Neopet can really enjoy playing at the beach! Available prize from the Return of Dr Sloth Prize Shop - 6,000 points. The ideal place for your codebreaking endeavours. Available prize from the Return of Dr Sloth Prize Shop - 8,000 points. Did that plasma arc just move? Given as a Daily Dare prize on Day 31, 2008. Given as a Daily Dare prize on Day 29, 2008. Run! There are doughnuts falling from the sky. Really, it doesnt smell THAT bad. Given as a Daily Dare prize on Day 12, 2008. Given as a Daily Dare prize on Day 4, 2008. Is that Edna? Watch out! Given as a Daily Dare prize on Day 3, 2008. Given as a Daily Dare prize on Day 1, 2008. Oh no there are empty hooks! This pretty pink background is quite dreamy. This is one background everyone will want to check out. Numbers, equations and sums... OH MY! It might be a bit sticky, but it tastes good! This background is very soft and easy to rest on. POP! Someone seems to have popped this bubble wrap a bit. This cozy holiday home scene is sure to put anyone at ease. Look at all of the pretty flowers! Ah, the water is just right. Lets learn something new today! Ewww... who would want to be inside a sticky, yucky jack-o-lantern? Owww... this background is burning up! If you cant decide between purple and orange this is the background for you! Let your Neopet explore their artistic talents in this creative setting. Background not for the lactose intolerant. Play time never ends with this background. Ah, nothing but grass, grass and more grass. Awww... the Snowager is SO cute! Dont forget to wish upon a star. Ah, the perfect surroundings for a picnic! Ahh... time to relax on the sofa for a bit. Now you can know what it feels like to be center stage. Ouch! Wow that is hot. Prize for registering at the Altador Cup II in Y9. Show other Altador Cup fans where your loyalties lie with this background! A fancy star field background for your Neopet! All items in this section can be worn solely by the Acara, excluding Maraquan and Baby Acara. More Acara specific items will be released on June 28th each year. This simple uniform is quite comfortable. A fancy headpiece fit for any Acara princess. Now to give an Acara a bit of a boost in swimming are some fins. All items in this section can be worn solely by the Aisha, excluding Maraquan, Mutant and Baby Aisha. More Acara specific items will be released on January 3rd each year. No one likes wet feet, and these rain boots are sure to keep an Aishas feet nice and dry. Keep the rain from running into your Aishas face with this nifty rain hat. It is said that Aishas do not like the rain. Now Aishas can pretend to be Lisha with these fun glasses! No Aishas wardrobe is complete without a space suit. All items in this section can be worn solely by the Blumaroo, excluding Maraquan, Mutant and Baby Blumaroo. More Blumaroo specific items will be released on August 8th each year. What an unusual hat, it has four bells not just three! This shirt is very festive! This dress sparkles and may tend to be a distraction if you do tricks. Blue and yellow stripes are a great combination. These shiny sandals are sure to go with most outfits. These shiny jester shoes are sure to get everyones attention. Awww what a cute sceptre. 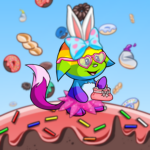 This bow hat will go with anything a Neopet might wear. All items in this section can be worn solely by the Bori, excluding Maraquan, Mutant and Baby Bori. More Bori specific items will be released on October 13th each year. Everyone will be able to spot you in this bright red hat. Any gnome will tell you that a beard is a necessity. This basic tunic will keep any Bori gnome stylish. These sturdy trousers will endure hours of gardening! These cozy shoes are perfect for any weather. Keep your feet warm and cozy with these soft socks. Add some sunshine to your wardrobe with this bright rainbow dress! Add a bit of flair to your outfit with this beautiful bow. All items in this section can be worn solely by the Bruce, excluding Maraquan, Mutant and Baby Bruce. More Bruce specific items will be released on December 5th each year. Look cute and charming in this pretty pink sweater. This skirt is cut to look splendid on any Bruce. This shiny heart shaped locket is a great treasure for any Bruce. Relax and think about fishing while wearing this fun shirt. Any Bruce will be stunning when they don this jacket. This shirt is the perfect addition to any tuxedo. All items in this section can be worn solely by the Buzz, excluding Maraquan, Mutant and Baby Buzz. More Buzz specific items will be released on January 11th each year. A Buzz will look beautiful at any event in this charming gown. Elegance is there when a Buzz is wearing these pretty gloves. These pretty shoes have details that are similar to the look of the Buzz. Keep any pesky pests away from your face with this hat. No Buzz will get stung wearing this fine suit. All items in this section can be worn solely by the Chia, excluding Maraquan, Mutant and Baby Chia. More Chia specific items will be released on February 18th each year. Chias should be careful if they wear this suit on Mystery Island. This flowing red dress is perfect for that Chia that wants to go out and have fun. All items in this section can be worn solely by the Chomby, excluding Maraquan, Mutant and Baby Chomby. More Chomby specific items will be released on March 22nd each year. All items in this section can be worn solely by the Cybunny, excluding Maraquan, Mutant and Baby Cybunny. More Cybunny specific items will be released on April 27th each year. Part robot and part Cybunny this is one fierce costume. All items in this section can be worn solely by the Draik, excluding Maraquan, Mutant and Baby Draik. More Draik specific items will be released on September 9th each year. Blend into the forest with this charming green tunic! Any Draik will look stunning when they sport this hat. These trousers have pockets for any extra tools you may need. These sturdy shoes will help you keep your footing. Not very useful without a bow, but they look very nice! Mmm... these warm baked goods will always be welcome at friends houses. This ruffled bonnet will help shield a Draiks face from the bright sun. No one wants cold feet! All items in this section can be worn solely by the Elephante, excluding Maraquan, Mutant and Baby Elephante. More Elephante specific items will be released on January 16th each year. They say it is quite nutty. What is the point of this umbrella? An Elephante will look very fierce with this headdress. This pink parka is very flattering for an Elephante. All items in this section can be worn solely by the Eyrie, excluding Maraquan, Mutant and Baby Eyrie. More Eyrie specific items will be released on October 10th each year. Eyries will be looking quite dapper in this wonderful coat. These boots are great for lots of walking in any terrain. These pyjamas will keep any Eyrie nice and cozy. Dont let your head get cold when you sleep! All items in this section can be worn solely by the Flotsam, excluding Maraquan, Mutant and Baby Flotsam. More Flotsam specific items will be released on July 3rd each year. Who doesnt want to wear this fun hat? Not only chefs will look charming in this jacket. It is said the music from this guitar will charm any sea creature. Flotsam will sparkle when they wear this shiny necklace. All items in this section can be worn solely by the Gelert, excluding Maraquan, Mutant and Baby Gelert. More Gelert specific items will be released on March 6th each year. All items in this section can be worn solely by the Gnorbu, excluding Maraquan, Mutant and Baby Gnorbu. More Gnorbu specific items will be released on January 6th each year. Maybe it isnt stylish, but it sure is warm. Plaid goes with everything doesnt it? What isnt great about a wool cardigan? Spectacles make a Gnorbu look distinguished right? This wool jacket is quite pretty and will keep any Gnorbu warm. Cold feet are not fun, but these boots are! All items in this section can be worn solely by the Grarrl, excluding Maraquan, Mutant and Baby Grarrl. More Grarrl specific items will be released on October 4th each year. Keep your head warm and dry with this charming hat. A stylish trench coat that is perfect in any weather. Perfect for reading all of the small print. This hauberk is a combination of leather and mesh to make it quite comfortable. This sturdy leather skirt is perfect for the warrior Grarrl! These sturdy sandals are made of wood and leather. Slippers should always be warm and cozy. All items in this section can be worn solely by the Grundo, excluding Maraquan, Mutant and Baby Grundo. More Grundo specific items will be released on August 24th each year. Goggles are great no matter where you are. It can get chilly in space. This handy belt is prefect for all of your space gadgets. These shoes are for more than just walking. These are very useful, but there arent any known uses. Your sock puppet show will be complete now. There must have been a mistake at the printers. All items in this section can be worn solely by the Hissi, excluding Maraquan, Mutant and Baby Hissi. More Hissi specific items will be released on May 4th each year. This festive costume will make any Hissi stand out in a crowd. Any Hissi will look quite stealthy in this thief gear. All items in this section can be worn solely by the Ixi, excluding Maraquan, Mutant and Baby Ixi. More Ixi specific items will be released on July 11th each year. No one will know or suspect who is wearing this hood. Keep warm and stylish with this cape. Not only is this headband really cool, but it is also great for when you are hiding in the forest. Ixi can now keep all of their valuables in this sturdy leather pouch. No one will cross an Ixi with this collar. Protect your legs with these sturdy leg wrappings. This shiny collar will have all of the other Neopets drooling. This bandana is stylish and also quite useful. All items in this section can be worn solely by the Jetsam, excluding Maraquan, Mutant and Baby Jetsam. More Jetsam specific items will be released on October 16th each year. Stay a bit dryer with this bright rain slicker. Keep that ocean spray off your head with this cute hat. Awww... what a pretty little blue bonnet. Don't look directly at the laser. All items in this section can be worn solely by the Jubjub, excluding Maraquan, Mutant and Baby Jubjub. More Jubjub specific items will be released on June 6th each year. This hoodie is good for those chilly autumn days. Keep your JubJub warm AND stylish. Your JubJub will never fear construction zones again. Make sure the sun is out when depending on this watch for the correct time. All items in this section can be worn solely by the Kacheek, excluding Maraquan, Mutant and Baby Kacheek. More Kacheek specific items will be released on January 29th each year. These baggy trousers will keep people laughing for hours. These shoes are large shoes to fill. The ruffle on this shirt is great for keeping your neck warm! Make sure you dont brush this wig. These goggles are prefect for Kacheeks with sensitive eyes. Keep your ears dry with this pretty pink cap. Make sure to protect your delicate complexion with some sun screen. Everyone will be jealous of you in this pretty bathing suit. All items in this section can be worn solely by the Kau, excluding Maraquan, Mutant and Baby Kau. More Kau specific items will be released on June 19th each year. This hat was specially made for the Kau and is quite comfy. Look stylish in this fancy vest! These jeans are great for work or play. Yer Kau will be stomping around in style with these fashionable boots. All of the Neopets will keep an eye out for you with this shiny badge. All items in this section can be worn solely by the Kiko, excluding Maraquan, Mutant and Baby Kiko. More Kiko specific items will be released on July 17th each year. Protect your Kiko with this space suit! This helmet provides clean air to a Kiko who is out in space. These sturdy gloves will help protect a Kikos hands in space. Hey dood, arent these shades cool? All items in this section can be worn solely by the Koi, excluding Maraquan, Mutant and Baby Koi. More Koi specific items will be released on May 25th each year. This tiara is perfect for that Koi that wants to be royalty. Keep your Koi happy this this fun outfit. A pretty shell lei will go with almost any outfit. This is the perfect accessory for the Koi that is scared to swim out into the open seas. All items in this section can be worn solely by the Korbat, excluding Maraquan, Mutant and Baby Korbat. More Korbat specific items will be released on October 26th each year. This clever helmet will help protect you from anything that might fly into you eyes or hurt your head. Keep warm when flying to Terror Mountain with this jacket. Keep from catching a chill and look debonair with this scarf. These trousers are perfect for any outfit. This shirt is perfect for those warm flights. The netting in this top will have friends wondering if you have spyder webs on you. This wig will frighten those that are a bit more timid. Black nail varnish goes with so many black clothes. All items in this section can be worn solely by the Kougra, excluding Maraquan, Mutant and Baby Kougra. More Kougra specific items will be released on April 22nd each year. Kougras can now explore and be prepared with this adventurer shirt. Kougras can now explore and be prepared with these adventurer shorts. Kougras can now explore and be prepared with this adventurer hat. Kougras can now explore and be prepared with these adventurer boots. All items in this section can be worn solely by the Krawk, excluding Maraquan, Mutant and Baby Krawk. More Krawk specific items will be released on April 16th each year. 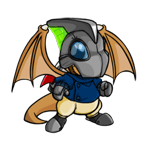 You cant get much scarier than dressing up as a Neopet who cursed an entire town. All items in this section can be worn solely by the Kyrii, excluding Maraquan, Mutant and Baby Kyrii. More Kyrii specific items will be released on August 29th each year. This brilliant red mage robe will have everyone jealous. 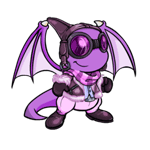 This cape is made with wool and it will keep a Neopet very warm. These shiny bracers are great for dressing up or just blinding someone. A Kyrii princess would be jealous of another Kyrii wearing this circlet. This charming barrette is made of glass. These beautiful cards are perfect for when you travel. Kyrii can now display their hatred of apples with this sign. All items in this section can be worn solely by the Lenny, excluding Maraquan, Mutant and Baby Lenny. More Lenny specific items will be released on February 12th each year. Ahh... a Lenny can look quite magical in this robe. Can you pull a Snowbunny out of your hat? With some training a Lenny may learn to control the magic of this wand. The calming colour and feel of this kimono is perfect for a quiet day. Keep your Lennys feet clean and protected with these clogs. All items in this section can be worn solely by the Lupe, excluding Maraquan, Mutant and Baby Lupe. More Lupe specific items will be released on May 2nd each year. Neopians will be calling your name when they see you in this heroic outfit. What lupe would want to dress up as a Chia? All items in this section can be worn solely by the Lutari, excluding Maraquan, Mutant and Baby Lutari. More Lutari specific items will be released on April 19th each year. Sorry, no Lutari specific items are available the moment. Looks like you'll have to wait until April 19th. For more items your Lutari can wear, try the clothing, hand-held, trinkets, or backgrounds sections. All items in this section can be worn solely by the Meerca, excluding Maraquan, Mutant and Baby Meerca. More Meerca specific items will be released on August 18th each year. This stylish dark beanie keeps your head warm and has glasses to help with difficulty seeing. This outfit has lots of pockets for storing items, only available in dark colours. Meerca tails will be pretty in pick with these fun bows! All items in this section can be worn solely by the Moehog, excluding Maraquan, Mutant and Baby Moehog. More Moehog specific items will be released on May 14th each year. Ewww... it is all soggy. This bag is perfect for holding all of your gear. This band soaks up that sweat right away! These sweatbands are perfect for when you are working out. All items in this section can be worn solely by the Mynci, excluding Maraquan, Mutant and Baby Mynci. More Mynci specific items will be released on February 22nd each year. Protect your head and have fun with these hat. This stylish riding shirt will dress up any outfit! White riding trousers are a great way to update any outfit. Make sure you dont play in the dirt with these gloves! These sturdy boots are perfect for riding. If you scratch a banana it smells... like a banana! These shorts are just too cute! All items in this section can be worn solely by the Nimmo, excluding Maraquan, Mutant and Baby Nimmo. More Nimmo specific items will be released on June 15th each year. Stealthy nimmos never looked this good. Keep your head warm with this ninja hood. Not only good for all of that sweat, but also a wonderful piece of decoration. These cozy pyjamas are quite stylish with their lily pad pattern! All items in this section can be worn solely by the Ogrin, excluding Maraquan, Mutant and Baby Ogrin. More Ogrin specific items will be released on December 28th each year. Keep warm with this fuzzy sleeping cap. Pyjamas are a cozy outfit for lying about. Oh! Fuzzy pink slippers are perfect! No rain outfit would be complete without a rain hat. Ogrins can keep dry with this stylish slicker. These galoshes are perfect for splashing around in puddles. All items in this section can be worn solely by the Peophin, excluding Maraquan, Mutant and Baby Peophin. More Peophin specific items will be released on July 26th each year. Peophins can look daring and festive in this hat. This jacket is sewn by hand and every detail that could be put into it was done. Hide your identity and look cool with this mask. This handsome neck scarf will help your neck stay nice and warm. What Peophin doesnt want to look trendy in this fun exercise shirt? That sweat wont get into a Peophins eyes who wears this stylish headband. This cozy tail warmer will keep a Peophins tail nice and warm. All items in this section can be worn solely by the Poogle, excluding Maraquan, Mutant and Baby Poogle. More Poogle specific items will be released on September 19th each year. CACKLE... only the most stylish wizards will be wearing this hat! The fabric this running suit is made of is great for keeping a steady body temperature and being safe. These shoes are very durable and perfect for either rough terrain running or running on roads. Keep the seat out of your eyes with this pretty sweatband. This sleeping gown is almost cute enough to be worn as a dress! Keep your head warm and cozy with this charming cap. What could be better on a cold day then some soft slippers. All items in this section can be worn solely by the Pteri, excluding Maraquan, Mutant and Baby Pteri. More Pteri specific items will be released on November 8th each year. This hood is a wonderful way for a Pteri to calm down and relax. The pink flower print on this hoodie is gives it a fun look. This super soft hat is perfect for sleeping. These fun cloud pattern pyjamas are super soft. All items in this section can be worn solely by the Quiggle, excluding Maraquan, Mutant and Baby Quiggle. More Quiggle specific items will be released on June 13th each year. Even Quiggles enjoy swimming with goggles. These fun swim trunks have veggies on them! Every Quiggle dancer should have this leotard. This tutu will flow gracefully as any Quiggle twirls. These slippers are so pretty they should be framed. All items in this section can be worn solely by the Ruki, excluding Maraquan, Mutant and Baby Ruki. More Ruki specific items will be released on July 29th each year. Even if you have a hard head it is best to be safe. Safety always comes first for the Ruki on the job. These trousers are durable and who can resist the tools? Rukis wont lose their traction with these boots. These adorable pyjamas are light weight but still warm. Ahhh... these are just so soft and cozy. All items in this section can be worn solely by the Scorchio, excluding Maraquan, Mutant and Baby Scorchio. More Scorchio specific items will be released on March 14th each year. All items in this section can be worn solely by the Shoyry, excluding Maraquan, Mutant and Baby Shoyru. More Shoyru specific items will be released on April 2nd each year. All items in this section can be worn solely by the Skeith, excluding Maraquan, Mutant and Baby Skeith. More Skeith specific items will be released on September 25th each year. Stained eating bib for the Skeith that doesnt care. Looks like these shorts got stuck in the Ice Cream Factory. But I dont want curls! Specially made to withstand the weight of the Skeith. This backpack hold a large amount of books and folders. GRRRRRR.... the wings flap on this pen when it is used. All items in this section can be worn solely by the Techo, excluding Maraquan, Mutant and Baby Techo. More Techo specific items will be released on September 13th each year. Perfect for keeping the sun off of your face. These shorts are what every shipwrecked Techo is wearing. These sandals are a bit rough on the feet... watch out for those splinters! Kelp goes well with almost every outfit. This dress is great for a day out or dancing the night away. This robe allows for a great amount of movement. All items in this section can be worn solely by the Tonu, excluding Maraquan, Mutant and Baby Tonu. More Tonu specific items will be released on February 21st each year. These trousers are perfect for a walk through the woods. No one will ever see your feet in these shoes. Blend in with this fun shirt. Even your head needs a bit of camouflage once in awhile. This is one hot horn decoration. This delicate tutu is perfect for any dancing Tonu. These pretty slippers will keep your Tonu on its toes. All items in this section can be worn solely by the Tuskaninny, excluding Maraquan, Mutant and Baby Tuskaninny. More Tuskaninny specific items will be released on July 12th each year. Neopets and Petpets will fear the Tuskaninny that wears this mask. What wrestling champ or super hero doesnt need a cape! This fancy belt is ultra cool, and besides it is shiny! Tuskaninnys are going to be staying warm with this fuzzy parka. Now a Tuskaninny can keep its neck nice and warm with this cozy scarf. All items in this section can be worn solely by the Uni, excluding Maraquan, Mutant and Baby Uni. More Uni specific items will be released on March 2nd each year. This fancy headdress is sure to impress anyone who sees it. Dress up any event with this pretty harness. Keep all of your gardening tools handy with this smock. Keep the sun from burning your face with this garden hat. Mud is a terrible thing to track into your house... well unless you have mud floors. All items in this section can be worn solely by the Usul, excluding Maraquan, Mutant and Baby Usul. More Usul specific items will be released on November 27th each year. The feel of the snow and ice beneath these skis will keep your Usul going this ski season. Every Usul needs pretty poles to go with these skis. Pink and grey will help your Usul be the brightest and prettiest Usul on the slopes. Brrr.... Cold ears are a terrible thing to have in the snow. Keep that pesky snow out of your Usuls face with these sturdy goggles. Comfortable and stylish is something the that Usul that wears this outfit is looking for. Inspire yourself and others to poetry with this fun beret. These sandals are comfortable and non-conforming. These are perfect for reading poetry for hours and hours and hours. This book is filled with poetry about beatniks and poetry written by beatniks. All items in this section can be worn solely by the Wocky, excluding Maraquan, Mutant and Baby Wocky. More Wocky specific items will be released on December 12th each year. Theyre trousers. Oh, and theyre black. The end. The anti-gravity model hasnt been released yet. The blue really goes well with the alien landscape. You still have to look good, even when you are sleeping! Keep the light out with this fashionable mask. Spotted for extra sleeping comfort. The fluffiness ensures a proper comfort level. All items in this section can be worn solely by the Xweetok, excluding Maraquan, Mutant and Baby Xweetok. More Xweetok specific items will be released on November 29th each year. Sparkle like you know you do on stage with this beautiful dress. Add a bit of mystery to your outfit with this fun hat. A popstar cant go on stage without their matching microphone! A bit of jewellery with any outfit is a great idea. This helmet is great for communication, and it also picks up a lot of music concerts. Everyone will know you love to explore when you wear this spacesuit. Keep your Xweetoks feet protected with these sturdy boots. Mark your place in the galaxy with this flag. All items in this section can be worn solely by the Yurble, excluding Maraquan, Mutant and Baby Yurble. More Yurble specific items will be released on May 28th each year. It looks like someone has been busy painting while wearing this smock. Stylish and creative is the description others will use to describe a Yurble wearing this beret. Any Yurble that knows how to paint will soon have many more colours on the pallet. Yurbles that love art will enjoy using this fine art brush. All items in this section can be worn solely by the Zafara, excluding Maraquan, Mutant and Baby Zafara. More Zafara specific items will be released on February 3rd each year. Hide your face and hair so no one can recognise you. This robe is great for being stealthy. Dont leave any trace that you were there with these gloves. Protect that beautiful complexion with this floral hat. Stand out from the natives with this festive garb. Remember all of those fun times and all of the silly times. item preview images , and if your pet can wear one of the items lacking a preview, then I'd like to hear from you. There are a few quick guide lines to follow before submitting, but if you see a snapshot of your pet in the magazine, you could be awarded your very own trophy! Not sure if an item needs your image? Here are a few cases where your help might be needed. If the item you plan to model for has a 'no preview' link underneath. Or if your pet's image would better suit the item than the current preview image. If your pet fits case 1, then your pet will most likely be accepted, and you are free to submit. An image of 'poor quality' is one in which the pet does not properly represent the item. Such a case would be a Flotsam wearing Kreludan Grundo Slippers, where the Slippers are turned into fin-coverings for the sake of the pet. Another such case would be an Aisha wearing the Sparkler, where the item acts as a trinket on the particular pet. Such cases do not properly represent an item, and you are free to submit your pet's image if it represents the item better. Neutral colours include the basic colours Blue, Green, Red and Yellow, or Plain colours such as White Brown or Orange. 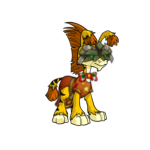 neutral coloured pet, such as a basic colour is more acceptable, but an item in which the pet's theme matches the item is preferable. A Darigan pet wearing the Purse of Despair would be an example of this. Please do not submit an item preview without reading and fully understanding the guidelines. You are free to neomail me if you have any questions. If you think you're pet is elligible to fill an item preview, then follow the instructions below and send it in. Remove all other clothing your pet is wearing, including backgrounds and paint brush items. The only item your pet should be wearing is the one you are modelling for. select and copy (Ctrl + C) the 8 character long text after /cp/ in the image URL. Go to this link and paste (Ctrl + V) the text into the neomail, along with the name of the item you are modelling for, and then send. And that's it! You've successfully submitted all the information needed. You are also free to customise your Neopet how you like. The preview you submitted will stay the same. If you see your pet on the page, good for you! Examples of pet previews that match the items. A perfect match. Previews that are are neutral, and don't clash with the items. A satisfactory match. Previews with clashing themes to the item. Need updating. Link back, help support those who support me, or apply for affiliation yourself. If you would like your petpage to be affiliated, your page will need to have linked back to N Magazine with the image link to the left, be of reasonable quality, and with a steady flow of hits. Displayed using a counter from boingdragon, or a screenie of your Neopet's petpage stats. 5000 hits , then you will not be accepted. This is due to the fact that many of the sites I link to are just starting up, and therefore have almost no visitors, and are likely to be taken down without notice. However, if it's obvious you put a lot of time and energy into your petpage, then I'll be pleased to add you, reguardless of hits. If you wish to become an affiliate of N Magazine, then neomail me here. The most exciting section of all! Where you get to read through credits, statistics, and everything else that I couldn't think of putting anywhere else. Over 25,000 unique visits per month.